Publisher’s Welcome Welcome to Northeast Harbor! You have chosen to visit one of the most naturally beautiful places in the country — Mount Desert Island. This PORT DIRECTORY is intended to enhance the time you spend in this area by providing easy access to information about places to stay, things to do and see, activities, and places to dine, among other things. In the back of the book, you will find an extensive index of merchants. 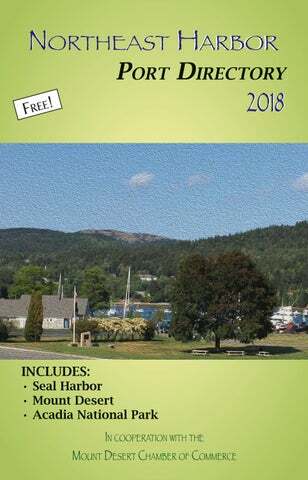 Also useful are the marina rules, rates and telephone numbers, tide charts, museum listings, church services, maps of Northeast Harbor, Cranberry Islands, Bar Harbor and Southwest Harbor as well as a full map of Mount Desert Island in the center section. It is our hope that the Port Directory will serve as a helpful reference book for the visitor, tourist, summer and year–round resident. We want this publication to be useful, fresh, fun, and appealing. Keep it aboard your boat, in your home, by your phone, or in your car. For additional copies, please ask at a place of business, Chamber of Commerce office, or just contact us. As we are a member of the Maine Tourism Association, our books can also be found at most visitor centers throughout the state. There was a point in March (and even April) that we were beginning to wonder if this was going to be another year that summer wasn’t going to come to Maine like in 1816! However, the promise of spring and warm weather seems to be here ... and we are ever so thankful. Good weather isn’t promised, and we need to do the best we can with what we get. I hope your time here will be filled with some sunshine, a little rain, and temperate climates. Our sincere wish is that you enjoy your time on Mount Desert Island, and thank you for reading the Northeast Harbor Port Directory. Northeast Harbor Port Directory – Volume XXXI ©2018. All rights reserved. No portion of this book may be copied or used without written permission of the publisher. Substantial effort has been made to ensure accuracy of all information. Prices, dates, or times could change following publication. We recommend calling to confirm before making definitive plans. Bayside Graphics does not guarantee the absence of errors or omissions, though we strive for correct information. Christina Boucher; Friends of Acadia; Island Readers & Writers; Lena Hatch Photography; National Park Service. My husband, Jonathan, without whom I would be lost; Emily Muise - friend, walking partner, sounding board, and proofreader extraordinaire (any errors are the sole responsibility of the publisher! ); Bruce Komusin (posthumously); Wes Shaw, Ripples Graphics; Acadia National Park Service; and the following Chambers of Commerce: Southwest Harbor & Tremont, Mount Desert, and Bar Harbor. © Bayside Graphics. After hiking in the area, it is so relaxing to just look out at the harbor! Whether it is from the deck of a local restaurant or just sitting on the grass or one of the benches, the view is always spectacular! This was created from a photograph with the Oil Paint Filter in Photoshop. If you ARE in the mood to cook, check out the recipes on the following pages. Open 7 days per week • 6:30 a.m. to 9 p.m. They are provided by our advertisers ... let them know you saw their ad AND their recipe in the Port Directory! 1 cup very coarsely chopped broccoli (frozen florets, defrosted overnight, dried w/paper towels) 3/4 cup (3 oz) sharp provolone, grated 6 eggs, whisked 1/2 cup heavy cream Dash nutmeg Salt and Pepper Preheat oven to 350˚. THURSTON’S LOBSTER POUND Look for our yellow awning on Thurston Road in Bernard and enjoy lunch or dinner at our working wharf overlooking scenic Bass Harbor. Haddock FisH cakes 1 lb. skinless haddock 2 Tbsp. lemon juice 2 Tbsp. white wine 1 egg 3/4 cup panko crumbs 1 white potato (cooked mashed) 1/4 cup whole milk 1/2 tsp. lemon zest 1 Tbsp. fresh flatleaf parsley (chopped) 1 Tbsp. fresh chives (chopped) 4 Tbsp. oil Sauce 1/2 cup mayonnaise 1 Tbsp. of capers (chopped) 1 tsp. horseradish 1 tsp. dijon mustard 1 small very finley chopped shallot Season haddock with lemon juice and white wine, bake in oven for 15-20 minutes at 350Ë&#x161;; let cool. Meanwhile, mix the sauce ingredients and set aside. Dice potato then boil until soft then let cool. In a mixing bowl add fish, potato, egg, panko crumbs, milk, lemon zest, parsley, and chives mix together. Divide the fish cake mixture into four cakes. Heat a large frying pan and add oil to pan. Fry the fish cakes over medium heat for about 5 minutes on each side, until crisp and golden. Serve with the sauce. Combine above ingredients. This can Mix well and add to vegetables just be made 2 hours ahead. Let stand at before serving. I did not use all the room temperature. Drain the juice from dressing... do a taste test! Emily Muise, Hertz the veggies before adding dressing! ShopS & Specialty StoreS I LOVE to shop ... how about you? On the following pages, and in the index, you will find all kinds of stores to meet your every need. From exquisite foods to beautiful furniture; fine custom jewelry to unique clothing; the best kids toys and clothes to home goods... and everything in between ... you will surely find all you need in the Mount Desert Island area! Shop local, and make sure you let them know that you saw their ad in the Northeast Harbor Port Directory! Look for the extensive index of advertisers starting on page 59 to find just the right business to meet your needs! local hands reaching out This year our focus for “Local Hands Reaching Out” is on an organization that works with our local children the future of our world! All photos in this article are used by permission of Island Readers and Writers. receives a personally-inscribed book by the author or illustrator. To date, the organization has given over 15,000 books to Maine children who were participants in hundreds of innovative programs. Budding artists show off their creativity during an IRW story and activity hour at the IRW’s programs are thoughtfully designed to augment the quality of Southwest Harbor Public Library. a young child’s education by sparking the imagination, helping develop critical and reflective thinking skills, and expanding worlds through hands-on learning in natural history, science, literature, writing and art. The organization works closely with teachers, school administrators, community leaders, Maine authors and illustrators, scientists, historians, and volunteers to ensure that its programs meet the individual needs and interests of the communities it serves. 207.244.0622 • Ice • Beer • Wine • Soft Serve Ice Cream • Baked Goods • Grocery & So Much More Just off the ferry on Great Cranberrry! ... we want to meet your needs! Liz McGhee. Participants will explore Southwest Harbor, and create art and writing inspired by their observations of nature. IRW will also host “Pop-Up Tent” events in Southwest Harbor and Northeast Harbor. Children’s book authors and illustrators will be on-hand to sign their books, which will be for sale. Look for the orange IRW tent at the Southwest Harbor farmer’s Continued on Page 20. Pick up your copy at the Mount Desert Chamber of Commerce in Northeast Harbor! market on Friday, July 20, and during the Northeast Harbor farmer’s market on Thursday, August 16. IRW is a small 501 c 3 organization whose book-centered programs reach on average 2,600 Maine children per year. This work would not be possible without the help of loyal supporters and volunteers. To learn more about our programs, volunteer opportunities or ways to support the organization, please visit our website: www.islandreadersandwriters.org. Or, if you’re in Southwest Harbor, come by the office at 246 Main Street and pick up a copy of our latest summer booklist. Happy reading! Tremont Consolidated School students flip through their newly autographed copies of Melissa Sweet’s book, Some Writer! The Story of E. B. White, after a visit from the author. & Tremontce SW Hbr.of Commer Chamber ion Building 9264 Informat 207-244t Ave.
that ferries and are two There Bar Harbor NOTE: just between & the Schoodic Park, travel Harbor Call Winter of Acadia Nationalan Bay. Section across Frenchmtheir current for listed Island 6 miles is FREE the the numbers s. There from you schedule Bus Service when Explorer Marine Center Schoodic arrive. AcBar Ha ad ia rbo We r 28 lco Are 8-5 me a C Mt 10 Ce of Inf . De 3 nte C orm ser r 28 ati t Isla 8-3 on 41 Ctr nd 1 r.r. is an oof This Map Th ementGRID 3 enlarg MA MAP D—1 Trenton LARGE N D SECTIOabove Marketplace IGA: 667-9597 and Tren Trenton of Commerce Chamber 6667-1259 Town Call Offices Goo se Cov e Rd. Keep your eyes open for the MDI Business Location Map. You will find even more lodging establishments listed on the back, along with activities, dining, services and shopping. And be sure to let the advertiser know that you found them on the back of the map, in the Port Directories ... or BOTH! MDI Hospital See a new side of the park! Events and volunteer opportunities to help care for Acadia National Park while you’re here. Membership that keeps you connected to Acadia all year long. marine and harbor The Northeast Harbor Port Directory is a useful guide and resource for boaters of every skill level and interest, visitors, and residents of Mount Desert Island. Packed with recent schedules, harbor information, rates and itineraries, it provides the most current information for business or pleasure. Bring a Port Directory with you on your next adventure! And remember to let them know that you saw their ad in the Port Directory! Price per foot, per night: Vessels under 49’ .............................................$2.85 Vessels 50’-59’ ................................................. 3.35 Vessels 60’ & over .............................................. 3.85 *Seasonal customers staying for either June and/or September are entitled to a 10% discount for those months. 1 sticker per slip (Use parking lot near Chamber of Commerce Yachtsmen’s Building). Vessels up to 19’6” ..............$25/night – $800/season Public Parking (Day use only): Use parking lot near tennis courts. LAUNCH RAMP (Round Trip): Non-residents ......................................................$ 5.00 FREE LAUNCH SERVICE: Residents ................................................................ Free Contact Harbor Master’s Office for hours. Commercial (residents & non-residents)..............15.00 Dinghy Space: Free to residents or included with mooring rental fee. Mooring Registration Fee: Resident .........................................................$56.00 Non-Resident................................................$106.00 (Paid annually--Applies only to Harbors with “Wait Lists”) Please note: While the above prices were correct at time of print, they are subject to change. Please check with the Harbor Master if you have any questions. Northeast harbor GPs CoordiNates: Latitude 44° 17” 11’; LoNGitude -68° 16” 37’ WEATHER INFORMATION MARINE & INLAND FORECASTS RADIO BROADCASTS MARINE: WDEA 1370 AM (Ellsworth) broadcasts marine weather every half hour. INLAND: WWMJ 95.7 FM (Ellsworth) broadcasts local weather at approximately 50 minutes past the hour, with more frequent updates between 6 and 9 a.m. INLAND & MARINE: WBKA 107.7 FM (MDI) broadcasts local and marine weather at 10 & 20 minutes past the hour and 10 & 20 minutes before the hour. A special broadcast from the top of Cadillac Mountain at 8:30 a.m. and lobstermen calling in weather from the water at 7:20 a.m. WEATHER PHONE: WDEA 1370 AM provides this service, sponsored by Bowden Marine. Call 207-667-8910. Tables are calculated from various government sources and the NOAA ﬁxed amount) method is used in annotation. WARNING — They may be subject to typographic or data entry error. Featuring local seafood dishes, seasonal sandwiches and salads, burgers, desserts and popovers. Our restaurant, overlooking scenic Northeast Harbor, serves lunch and dinner daily. Beal & Bunker, Inc. provides the only yearround commuter service between the Cranberry Islands and NORTHEAST HARBOR. We welcome you to enjoy the fresh air & lovely views aboard our reliable, fully-equipped, and USCG inspected boats driven by experienced crews. Beal & Bunker, Inc. also has boats available year-round for island picnics, wildlife viewing and private charter needs. Please call for charter availability and price quotes. acadia’s historic carriage roads Used by permission from Acadia National Park. area lodging My, oh my, oh my! This is such a beautiful place ... I want to LIVE here! Is that what you’re thinking? Then check out one of the real estate agencies you will find on the following pages! Here for a quick visit? Make SURE you return! You will find B&Bs, Cottage Rentals, Hotels and Inns. Something for everyone! For all your real estate needs on Mount Desert Island and the Downeast Maine coast. Distinctive properties. Legendary service. construction funds along with matching private funds from Friends of Acadia, a nonprofit organization dedicated to protecting the outstanding natural beauty, ecological vitality, and cultural distinctiveness of Acadia National Park and surrounding communities. Woody vegetation was removed from roads, shoulders, and ditches, and drainage systems were reestablished to arrest erosion. The crown and subgrade layers were restored, and new surface materials were applied to replace thousands of cubic yards washed away over the years. Coping stones were reset or replaced, and some of the historic vistas that once greeted horseback riders, carriage drivers, and walkers were reopened. To ensure that the carriage roads will continue to be maintained close to their original condition, the park has formed a partnership with Friends of Acadia. In 1995, Friends of Acadia established an endowment to help protect the carriage roads in perpetuity. Each year, the organization contributes more than $200,000 from this endowment to the park for carriage road maintenance. Volunteers working under the guidance of Friends of Acadia contribute thousands of hours cleaning ditches and culverts, clearing brush, and assisting park staff with other restoration projects. The commitment demonstrated by Friends of Acadia in maintaining the carriage roads is only one of many ways the organization helps support the park. © Friends of Acadia A portion of park user fees, authorized by the Recreational Fee Demonstration Program, also helps fund carriage road maintenance. Between 2001 and 2004, federal funds and park user fees paid for a major re-pointing, cleaning, and water-proofing of all carriage road bridges within the park. User fees have also funded annual projects, including repairing stone walls and opening overgrown vistas. More than one hundred vistas have been cleared in the past ten years. A Spirit of Philanthropy Park volunteers, visitors, and groups like Friends of Acadia are continuing a tradition of philanthropy begun by John D. Rockefeller Jr. and other early conservationists. Their valuable contributions of time, effort, and funds help protect the park and improve the quality of your experience. For more information about joining in these efforts, stop at Hulls Cove Visitor Center or visit the Friends of Acadia website. Such generous spirit allows the park to better meet its mission of protecting and preserving its cultural and natural resources for present and future generations. Times and dates updated at time of printing. Please call individual numbers or check the websites for updates. We apologize if any changes were made post-production. Ongoing Thurs., June 28 to August 30: Northeast Harbor Farmer’s Market. The best variety of fruits and vegetables; free-range pork, beef, lamb, and rabbit; and more. On Huntington Rd. across from the Kimball Terrace Inn. Fri., Late June - Oct. 5: Southwest Harbor Farmer’s Market. 9am-1pm. Pick up produce and eggs from local farmers, as well as farm-raised meats and freshly-baked goods. Main Street parking lot of St. John Church. Thursdays in July and August: Art Gallery Openings. Northeast Harbor. Thurs., Aug. 2 - 23: Outdoor Movie Night at sundown. Village Green (Veteran’s Park), Northeast Harbor. Mon. & Thurs. July 2 through August 13: Bar Harbor Town Band. 8-9pm. Free concerts on the Village Green, rain or shine. Main & Mt. Desert Streets, Bar Harbor (Congregational Church in Bar Harbor if raining). May 22 to September 30: Self-Guided tours of Historic St. Saviour’s Episcopal Church. 41 Mt. Desert Street, Bar Harbor. Brochures available for self-guided tour of the church and its renowned stained glass windows (Tiffany, English glass, Italian stone work). For more info, (207) 288-4215 or stsaviours.me. Wed., July 11 to August 8: Seaside Cinema. Family movie night in Agamont Park in downtown Bar Harbor. In the event of rain, shows will be canceled. Call 207-288-5103 for cancellation notices. May 31 - June 3 : The 20th Annual Acadia Birding Festival. Celebrate the ecological wonders of the birds of the Gulf of Maine. acadiabirdingfestival.com. (207) 288-8128. June 1: First Friday Art Walk. Downtown Bar Harbor, 6-9pm. Pick up a map from the Chamber of Commerce, lodging establishment, or gallery and begin at any venue. Follow the ART Walk flags. June 2: National Trails Day. Discover, enjoy, and care for Acadia’s magnificent 125-mile trail system, accompanied by park trail crew and interpretive staff members. nps.gov. June 3: 6th Annual Acadia Half Marathon. Starts and ends in front of the YMCA, 21 Park Street, Bar Harbor. Call (207) 288-3511 for more information. June 8: Historic Maine Cooking. 2-4:30pm.Ambrosia Cooking School, 19 Rodick Street, Bar Harbor. Call 288-4523. 6-10am-Blueberry Pancake Breakfast. MDI Rotary Club, Bar Harbor Athletic Field, Park Street, Bar Harbor. A fun morning feast for the whole family. 7:30am-2:30pm Bar Harbor Nonprofit Showcase Bar Harbor (MDI) Rotary Club, Bar Harbor Athletic Field, Park Street. A variety of Maine nonprofits sell goods, raffle items and provide information on their nonprofit organization. 9am-3pm-Craft Fair. MDI YMCA. A wonderful selection of Maine crafts - jewelry, quilts, and more. Joint fund raiser for the YMCA and YWCA. 10am-Independence Day Parade winds through downtown Bar Harbor. 11am-2pm-Seafood Festival. MDI Rotary Club, Bar Harbor Athletic Field, Park Street. Enjoy lobster, mussels, corn, strawberry shortcake, and more. After Parade-Lobster Races. Watch local businesses put their lobsters to the test in a “high-speed” crustacean contest! MDI YMCA, Bar Harbor Athletic Field, Park Street. Proceeds benefit the MDI YMCA. 11:30am-2pm-Seafood Festival Entertainment, Bar Harbor Athletic Field. Free live concert during the Seafood Festival. 3:30-9pm-Free concert series in Agamont Park. Family-friendly tunes for dancing and listening as you wander by the harbor or stake out your seat for the fireworks. 7:30-8:30pm-Bar Harbor Town Band. Free concert on the Village Green, Mt. Desert Street, Bar Harbor. Approximately 9:15pmBar Harbor: Enjoy the spectacular display of fireworks over Frenchman’s Bay. Southwest Harbor: The Southwest Harbor & Tremont Chamber of Commerce is hosting a fireworks display this year. Fireworks will be visible from many locations around the harbor. Rain date, July 7. July 6: Bar Harbor Music Festival. 8:00pm. Bar Harbor Congregational Church, 29 Mount Desert Street, Bar Harbor. Alexandra Beliakovich, Pianist. July 7: 2018 Native American Festival and Basket Makers Market. Offers visitors, collectors and gallery owners the opportunity to buy directly from the artists, as quality and authenticity is the hallmark for this Wabanaki Market. 10-4, College of the Atlantic, 105 Eden Street, Bar Harbor. (207) 288-3519. July 10: Bar Harbor Music Festival. 8:00pm. POPS Concert, Janinah Burnett, Soprano; Cara Chowning, Pianist. The Great Room, Bluenose Inn, 90 Eden Street, Bar Harbor. Pre-Concert Dinner served beginning at 6pm (optional). July 10: Annual Strawberry Festival at the Somesville Fire House. 1-3 pm. Our traditional celebration of history and strawberry shortcake. Yum! (207) 276-9323. July 24: Mt. Desert Festival of Chamber Music. Neighborhood House, Main Street, Northeast Harbor. 8:15pm. Escher String Quartet. July 25: Bar Harbor Music Festival. 8:00pm. Blackwoods Campground Amphitheater, Otter Creek; 46th Annual Acadia National Park Outdoor Concert. Bar Harbor Festival String Orchestra, Francis Fortier, Conductor. Rain date, July 26. July 26: Summer Artisan Market and Music. 4pm. Northeast Harbor Marina. July 26: Annual Butterfly Release at Charlotte Rhoades Butterfly Garden. 3:30pm. This annual event is a wonderful family affair that is fun for everyone! $30 per person 12 and over, includes one butterfly. Children under 12, free admissionbutterfly not included. Reservations required. (207) 266-6047 or (207) 244-9264. July 26: Bar Harbor Music Festival. 8:00pm. Bar Harbor Congregational Church, 29 Mt. Desert Street, Bar Harbor. 14th Annual Bob Noonan Memorial Concert. Bar Harbor Festival String Orchestra, Francis Fortier, Conductor; Antonio Galera-Lopez, Piano Soloist. July 27-29: 43nd Annual Directions Craft Show. MDI High School, Bar Harbor. Friday: 5 - 9pm; Saturday & Sunday: 10am - 5pm. 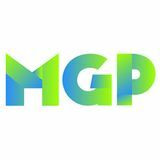 mainecraftsguild.com. July 28: Open Garden Day. The Garden Club of Mount Desert, 8am-5pm, Rain or Shine. www.gardenclubofmountdesert.org. July 28: Mount Desert Summer Chorale. 50th Anniversary Gala. 7:30pm. Northeast Harbor Concert, St. Mary’s by-the-Sea. mountdesertsummerchorale.org. July 28-29: Gallery on the Green I, by the Coastal Fine Art Alliance of Maine. More than 50 of Downeast’s most recognized artists, including winners of top awards and national competitions, will take part in this summer’s annual outdoor show. Pemetic Green, Southwest Harbor. Rain or Shine. (207) 244-9264. July 29: Bar Harbor Music Festival. 8:00pm. The Gates Center, College of the Atlantic, 105 Eden Street, Bar Harbor. Festival Gala. Pre-concert dinner at 6pm (optional). Bar Harbor Festival String Orchestra, Francis Fortier, Conductor. July 29-August 4: Annual Claremont Croquet Classic. Players compete in a nine-wicket doubleelimination tournament in both singles and doubles competition. Players and spectators alike enjoy this annual event. (800) 244-5036. July 31: Mt. Desert Festival of Chamber Music. Neighborhood House, Main Street, Northeast Harbor. 8:15 pm. Ensemble of Guest Artists. August 3-4: Mount Desert Summer Chorale. Acadia Centennial Concert, Elijah. 7:30pm. (Pre-Concert Talk, 7pm.) St. Saviour’s Church, 41 Mt. Desert Street, Bar Harbor. mountdesertsummerchorale.org. their pre-1972 cars. The public is invited to visit the Auto Museum to see the cars arrive and meet the race teams. 11am: Shuttles begin 12:00 –12:15pm: Opening Ceremonies 12:15–3:15pm: Cars will arrive throughout this period at one-minute intervals June 28: CAR-B-QUE. 4pm – 9pm. Car show, barbeque, and live music, all wrapped up into one super-fun event! 4-9pm: Vintage Cars on Display 6-9pm: Barbeque, Provided by Nostrano (available for purchase) 7-9pm: Live Concert, Featuring: Danny Harper July 19: Demo Day: Hidden Gems of the Collection. See event on June 21. 10am-4pm. July 21: Cars & Coffee: See event on June 9. All are welcome, with or without their own antique or vintage auto. 9am-12pm. This month will feature Corvettes! You are encouraged to bring an early Corvette of your own in the morning, or any other antique or classic car if you don’t have a Corvette but would like to drive over your favorite old car. The Cars & Coffee in the morning will be followed by kids’ activities in the afternoon, including rides in the museum’s cars, weather permitting. July 21: Kids Day: Games; Remote controlled car races; Demonstrations; Noise-making & explosions; Tasty treats to eat; Rides in antique autos, weather permitting. Kids 12 and under get in free! 12-4pm. July 29: Murder Mystery Dinner: Join us for dinner among our collection of elegant antique cars and help determine the killer when a murder occurs! Prizes awarded. Costumes encouraged but optional. Character profiles available. More details to follow. 6-9:30pm. August 8-9: Watercolor Workshop with Judy Taylor: In a truly unique workshop experience, Judy Taylor will guide participants into the world of vintage car ads, to an era in advertising that had “caught on” to the power of grabbing readers’ attention with visuals – essentially headlines in themselves. All day. Call for more information. August 11: Cars & Coffee: See event on June 9. All are welcome, with or without their own antique or vintage auto. The August Cars & Coffee will feature British cars and a London to Brighton Vintage Car Rally program. 9am-12pm. August 16: Demo Day: Hidden Gems of the Collection. See event on June 21. 10am-4pm. August 18: Tom Cotter, author and Hagerty’s Barn Find Hunter, will be at the museum for the day with his Cunningham C-3. He will have some of his books available and video as well. 10am-4pm. September 15: Cars & Coffee: See event on June 9. All are welcome, with or without their own antique or vintage auto. 9am-12pm. Bring your favorite four-footed friends, as the September Cars & Coffee will feature canines, with the Hancock County SPCA. September 21: Demo Day: Hidden Gems of the Collection. See event on June 21. 10am-4pm. October 13: Cars & Coffee: See event on June 9. All are welcome, with or without their own antique or vintage auto. 9am-12pm. The October Cars & Coffee will feature Ford’s early As, Ts, and the other Ford “Alphabet Cars.” October 18: History Happy Hour; geared towards members of the Seal Cove Auto Museum and the MDI Historical Society. These events provide an opportunity for members to mingle with friends, neighbors, and fellow history buffs, imbibe local spirits, and learn a little something new. Nonmembers have the opportunity to join both the Seal Cove Auto Museum and MDIHS at a special dual membership rate of $50. Location to be determined. For more information on the above programs and events, hours and admission prices: call (207) 244-9242 or visit the museum website sealcoveautomuseum.org. The Thuya Garden and surrounding land is a wonderful blend of semiformal English border beds and indigenous eastern Maine woodlands situated on a granite hillside overlooking Northeast Harbor. Visitors by sea can tie up at Asticou Terraces Landing and walk up the 1/4– mile Asticou Terrace Trail to the garden and lodge, passing the Joseph H. Curtis Memorial and enjoying the views from several lookouts along the way. Parking is available at the landing and at the top of Thuya Drive.